Remember that fabulous Louis Vuitton Fall 2011 ad campaign featuring Christy Turlington, Karen Elson and Natalia Vodianova? Obviously I do, and so did this bride–her pert pony could be pulled from Steven Meisel's photos! I love its spunky irreverence, but it's still perfectly appropriate for her sumptuous ballroom celebration–and if you simply must try it out this weekend, Glamour has step-by-step instructions! Image by Sara Wight Photography. This is so adorable!! I always envy a perfect pony... I can never seem to get it right myself. Awwww, this is so pretty/lovely! How fabulous! Why do my pony tails never look so sleek & polished? Why is it that my ponytails never look as good this?! I love ponytails as well but they dont love me. I need to learn how to do those for me... Cute! 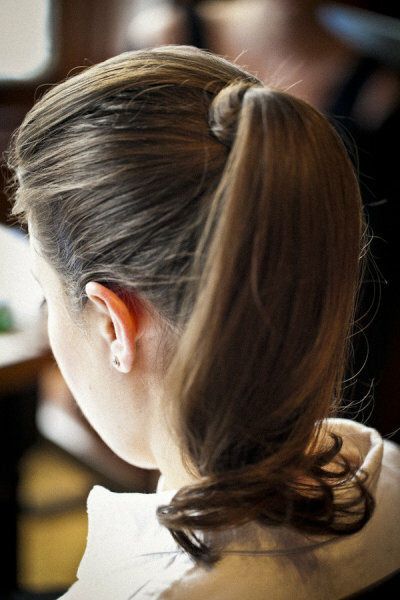 I love brides in ponytails - so sophisticated, classic, and sleek! Perfection!!! There is nothing like a fabulous pony!! !